Posted on March 29, 2018 by Emily Allbon. 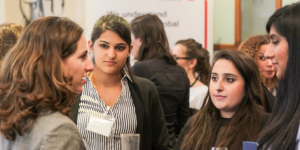 Book your place at the Law Alumni Networking Reception on 4th April 2018 to network with a sparkling selection of alumni from the City Law School. You’ll be able to meet those alumni working in the legal sector as well as current students on law programmes, and participate in an engaging networking game (!). Registration is between 17:30 and 18:00 and the event will kick off with a speech from the Interim Dean, Professor Chris Ryan. The networking game ‘Would I lie to you?’ will follow. Drinks and nibbles will be served throughout the evening. Find out more and register to attend via the City Events website.